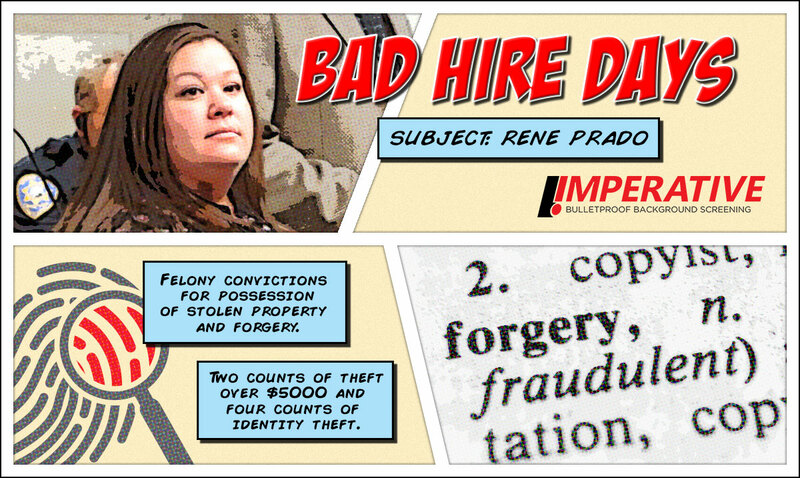 In 2002, Renee Prado received felony convictions for possession of stolen property and forgery. Four short years later, she was hired as an office technician in Yakima County, Washington’s Human Services Department, where she oversaw vouchers for Drug Court participants. Now you may wonder how someone with convictions for possession of stolen property and forgery could be hired into a position with financial responsibilities. Because they weren’t conducting background checks, the county was unaware of Ms. Prado’s relevant and recent criminal history! “Don’t ask, don’t tell” is not a good hiring policy when it comes to applicants’ past behavior. So what does a convicted forger do now that she has unfettered access to county money? Exactly what you would assume. While working at the Human Services Department, she forged $72,289 worth of vouchers intended to help participants in the county’s Drug Court pay for rent, utility bills, food, and clothing. Instead, they helped Ms. Prado pad her bank account. It only took a $72,289 loss for the state investigation to uncover weaknesses in the way the county operated the voucher program. The failure to conduct adequate background checks and to put in place basic check-and-balance controls were identified in the investigation report as significant problems in the voucher program. Although the damage was done, it’s easy to see how a thorough background check performed by Imperative could have saved the county tens of thousands of dollars and a whole lot of embarrassment. Download the Seven Steps to Making Bulletproof Hiring Decisions to create a screening process that keeps criminals, creeps, and crazies out of your company while avoiding loss, litigation, and liability!